Bring your product ideas to Broki. Starting in the construction pahse we will look for a route to solving the problems you present taking efficiency, quality and costs into account. Our team in construction will support you with the most modern 3D-software, so that we can get a real impression of your products before production starts. 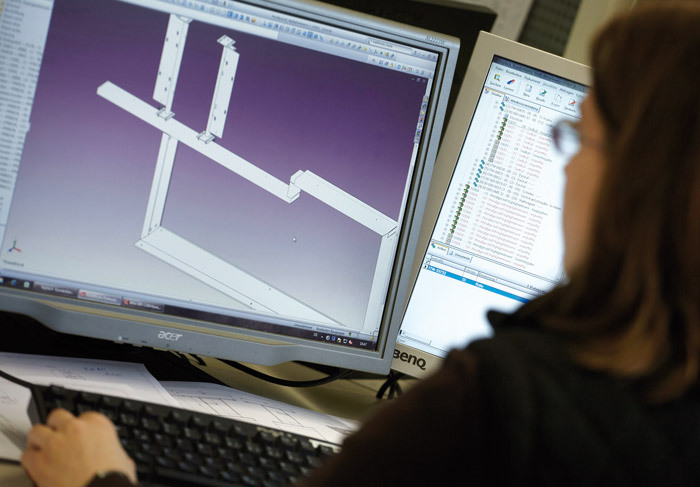 Constructions are designed with our manufacturing environment in mind and we provide all machine data automatically as soon as the drawings are approved for the corresponding departs so that low cycle times are realised. 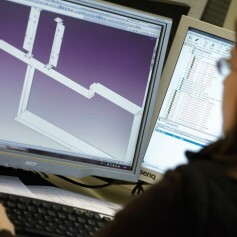 In order to realise multiple manufacturing processes, we need flexible tool construction. 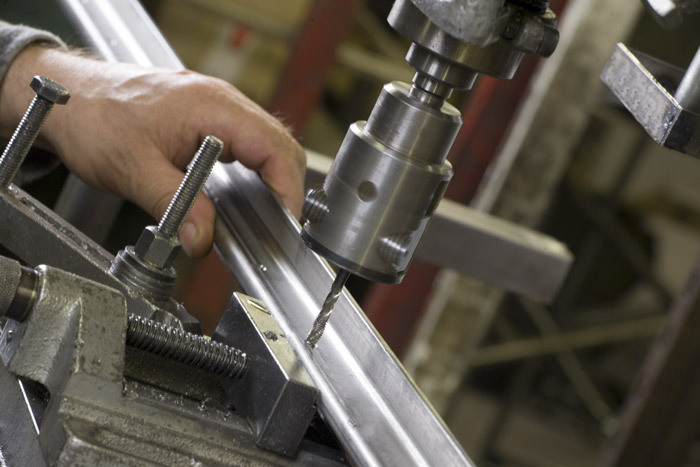 We manufacture our welding fixtures in our own tool making facility along with all pipe stamping and forming tools. Our modern inventory of machines and experienced employees are at our disposal. Our pipe stamping plants cut pipes and U-profiles with the corresponding perforations for piping elements common to shop fitting. Along with a number of perforation tools with a wide variety of perforation patterns, we also construct customised perforation patters to customer specifications. 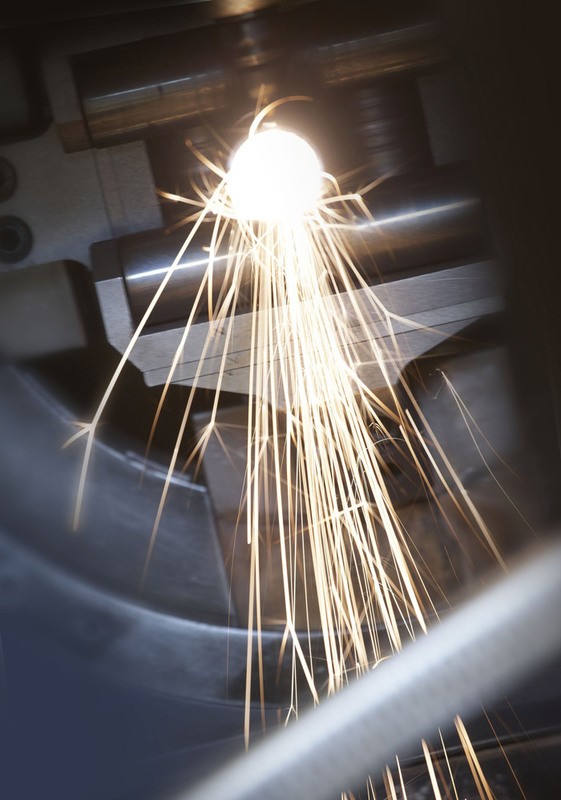 Our laser cutting machine has a linear drive and thereby combines precision and speed. 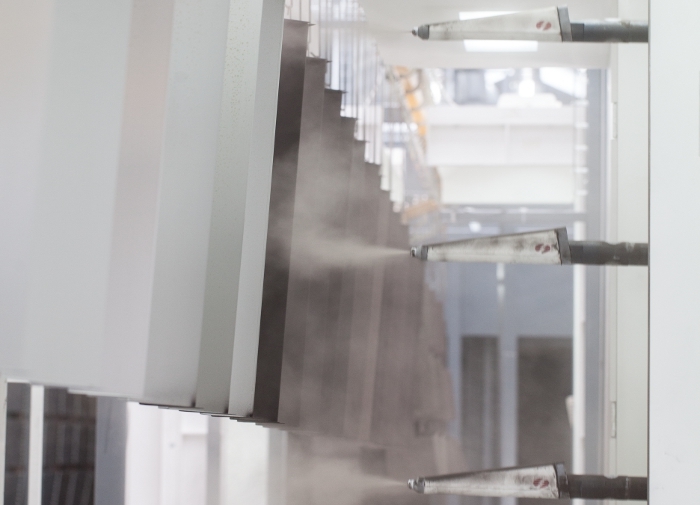 We process sheets from 3000 x 1500 mm, stainless steel sheets up to 25 mm as well as aluminium sheet up to 25 mm sheet thickness. 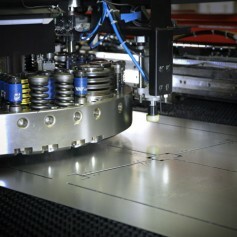 Perfect exterior contours as well as filigree interior contours are standard in laser cutting. 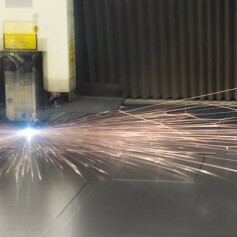 Laser pipe cutting machines generate pipe penetrations of all kinds with the highest precision and cost effectiveness. We at Broki process pipe sections up to an exterior diameter of 150 mm with a length of 6000 mm. 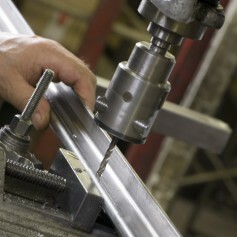 The maximum length of a finished part is 3250 mm. We process steel pipes with a wall thickness of up to 6 mm, stainless steel pipes with a wall thickness of up to 5 mm and aluminium pipes up to 4 mm. 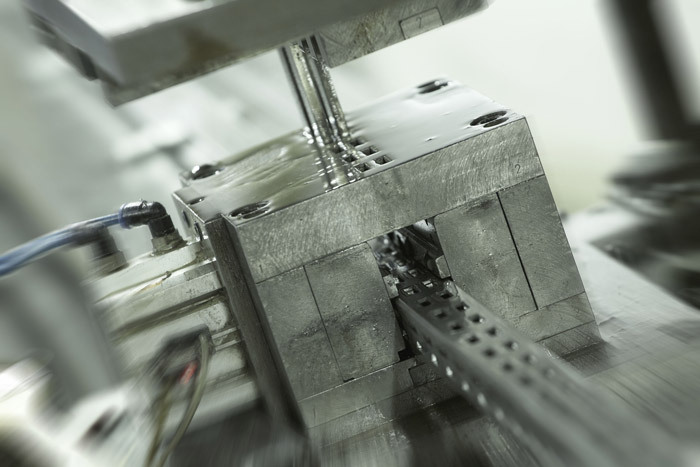 CNC-stamping machines at Broki fulfil requirements for high, consistent product quality – with the greatest possible flexibility and cost effectiveness. 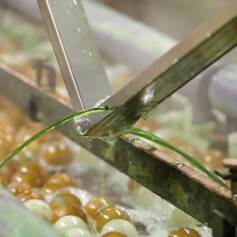 Processing that saves material and high precision eliminate the need for expense re-working in the subsequent processes. 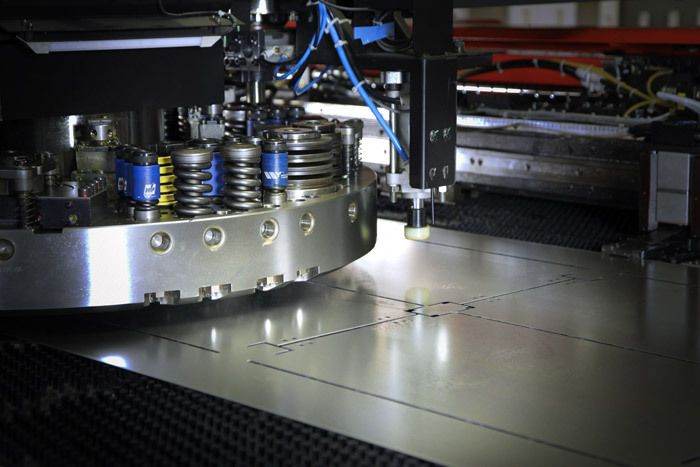 We process metal panels up to 2500 x 1250 x 4 mm in stainless steel, aluminium and sheet metal. 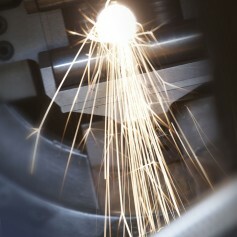 To further round out our depth in production we cover the entire spectrum of mechanical processing in our own facility. 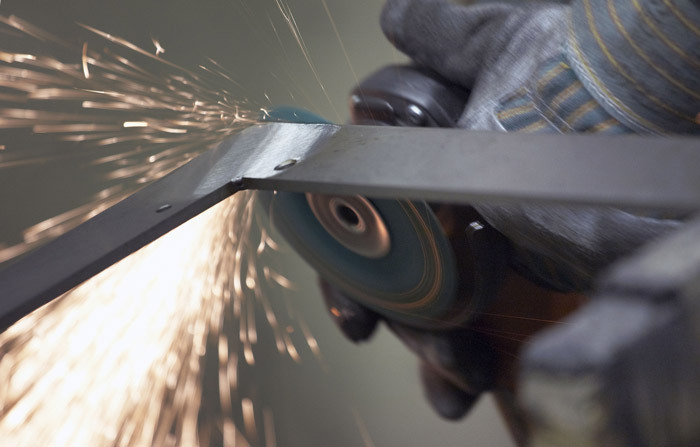 Thread cutting and de-burring are just as much a part of it as sawing, milling and lathing. This assures that the value adding chain and warranties remain with Broki, which is to your advantage. 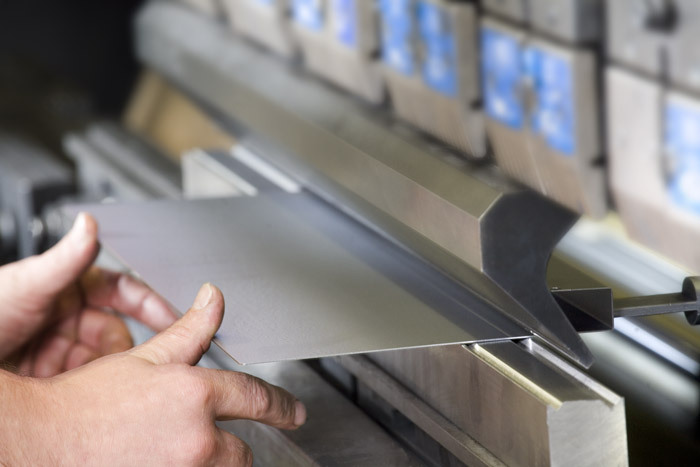 Laser cut or stamped sheet metal parts are then bent in later production processes and thus made three-dimensional. 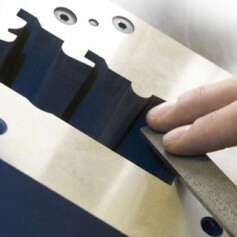 Even complex parts can be produced quickly and precisely. 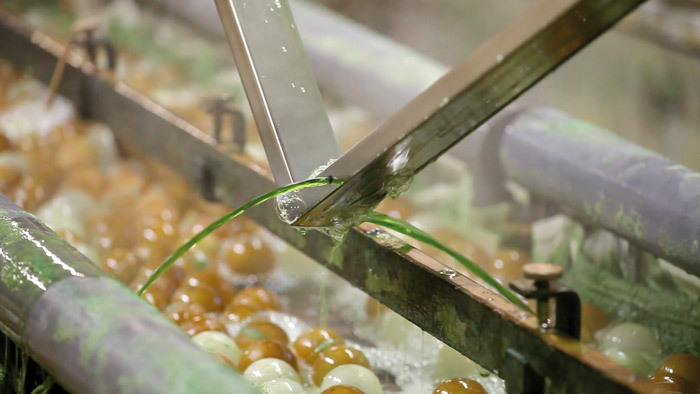 NC-controlled trimming presses and swivel bending machines make flexible production possible. 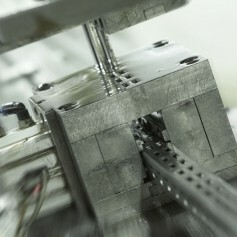 Additionally, simple forming work is done on our eccentric presses. 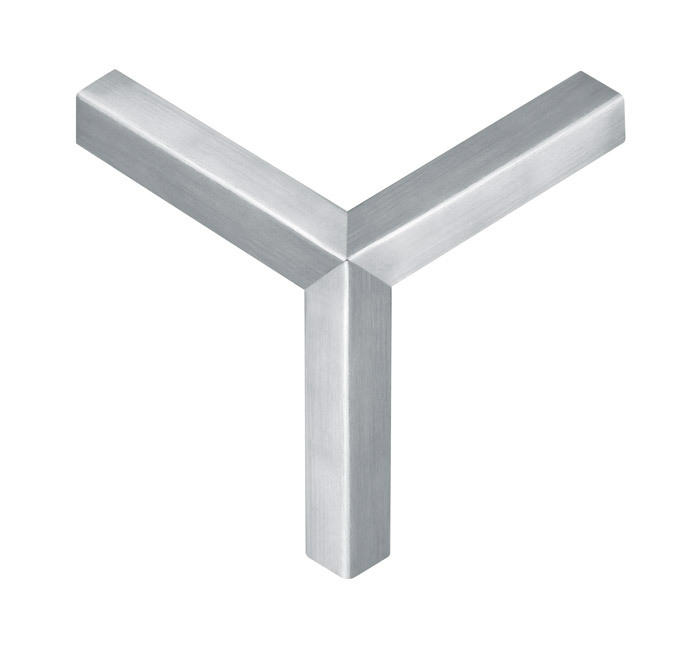 If you are looking for the ideal connection for aluminium, steel and stainless steel, we at Broki will always offer you the best solution. We are optimally equipped for all welding processes: MAG-Welding , MIG-Welding , WIG-Welding , spot welding or bolt welding. 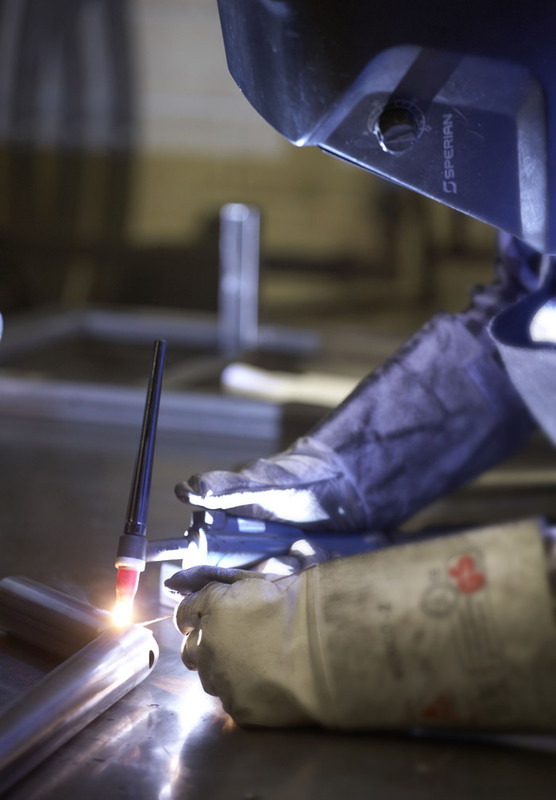 Our welders are tested for compliance with DIN 287-1. 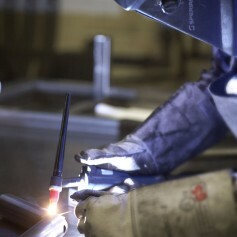 Broki’s welding operations are DIN 15085-2 certified. 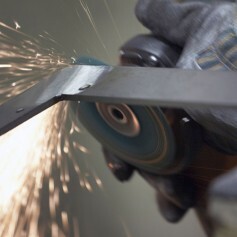 Once welding is completed, surface finishing begins. 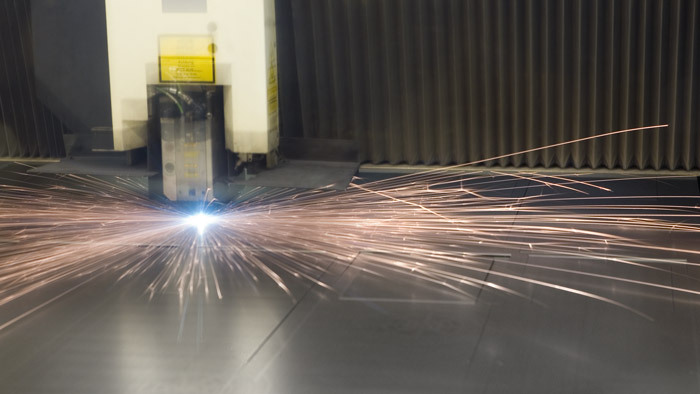 This includes grinding down the weld seams on the surfaces of steel elements that are to be powder coated, 3D-surface grinding for decorative stainless steel parts or clean polished surfaces a preparation for chroming. We have the technology in-house. 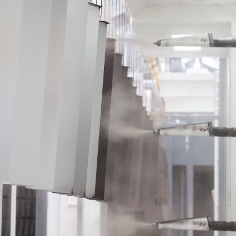 Through our own powder coating procedure we can improve your products over a large colour spectrum. You can select RAL –standard colours and special colours in various surfaces, structures and degrees of gloss. We process parts of max. 4000 mm length, 1700 mm height and 1300 mm width. To round out our range of services in metal processing for your our customers, we finish your presentation furniture with the surfaces you desire right here in our own production facility. Along with high-quality ground and brushed stainless steel surfaces, we can also offer an especially highly processed „polished“ surface. 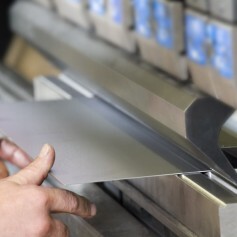 Our portfolio not only includes surface finishing but also various processing options for mitred corners. In Broki’s electroplating shop, semi-finished and finished parts are given the desired surface finishes (bright chrome, matte chrome, nickel). The following dimensions are processed here: length 2200 mm, width 650 mm, height 1200 mm. 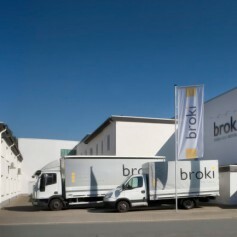 Broki offers its customers a flexible range of logistics services. You determine how we produce and deliver. For you as a customer, we can manufacture and warehouse ahead of time based on master contracts and you then call your products, we complete them all the way to delivery with our own factory lorries or by hiring a freight carrier. You benefit from the price advantage of a optimal production size for use as well as from the rapid availability of all articles. At Broki we always have the perfect packaging solution for our customers. We send your products to you at your request and safely packaged.